Perhaps you’ve shared this feeling—this solastalgia, as Australian philosopher Glenn Albrecht calls it: a form of human psychic distress caused by the loss of nature. The disappearance of that horizon serves as example and metaphor, a reflection of how our society is out of balance, often overwhelmed by technology. Every day, it seems, we’re enervated by empty calories, empty suits, empty politics, empty financial institutions, empty architecture, empty schools, empty news— emptied land. The eco-theologian Thomas Berry, a man who knew the power of practical dreaming, said the “Great Work” of the 21st century would be to reconnect our humanity to the reality and spirit of nature, to the fullness of life. 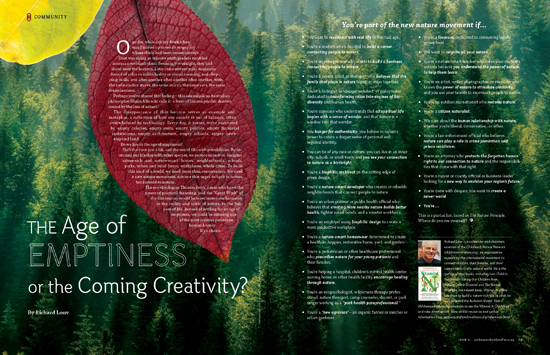 Instead of settling for an age of emptiness, we could be entering one of the most creative periods in human history. You’re a parent, child, or therapist who believes that the family that plays in nature together stays together. You’re a biologist, landscape architect, or policymaker dedicated to transforming cities into engines of biodiversity and human health. You can be of any race or culture, you can live in an inner city, suburb, or small town, and you see your connection to nature as a birthright. You’re an urban planner or public health official who believes that creating more nearby nature builds better health, tighter social bonds, and a smarter workforce. You’re a nature-smart homeowner determined to create a healthier, happier, restorative home, yard, and garden. You’re a pediatrician or other healthcare professional who prescribes nature for your young patients and their families. You’re helping a hospital, children’s mental health center, nursing home, or other health facility encourage healing through nature. You’re a “new agrarian”—an organic farmer or rancher or urban gardener. You’re an artist, writer, photographer, or musician who knows the power of nature to stimulate creativity, and you use your talents to reconnect people to nature. You care about the human relationship with nature, whether you’re liberal, conservative...or other. You’re …. This is a partial list, based on The Nature Principle. Where do you see yourself?